Hong Kong Dragon Boat Festival is also called "Tuen Ng" Festival. It is on the 5th day of the 5th month on the lunar calendar. Click here to check out the exact date to plan for your next Hong Kong vacation. It is for the memorial of a patriot, poet and government official in the past. To learn more about the story, click here. In my opinion, the biggest thing of this tour is having the Chinese rice dumplings. It is wrapped around with bamboo leaves. If you miss the season, you could happen to see it served in the Cantonese tea house (coming soon link to Hong Kong Domestic Food page) as "dim sum" and/or some mom-and-pop stores throughout the year. Although this is a Chinese festival, there is always international competition which lasts for 3 days. The picture on top of this page was taken during the international Dragon Boat racing. Pretty impressive, huh? 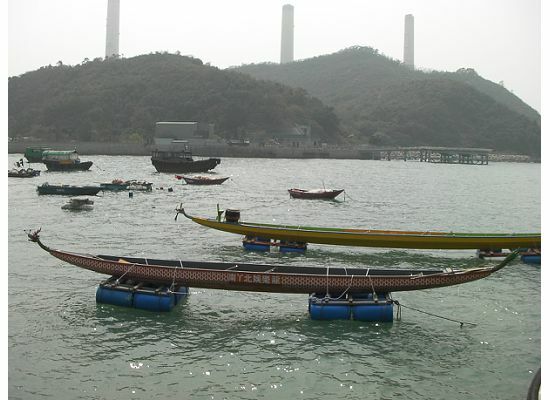 Look at these dragon boats in Lamma Island. Aren't they gorgeous? 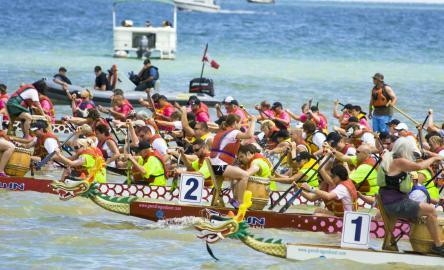 As a tourist, you may want to watch a dragon boat race live. Throughout my life, we watched it on the TV. It is because the races are always in the remote area. It was difficult, especially when transportation was not that convenient. Plus, this time of the year the weather is very humid. When I was in Lamma Island in 2009, I finally saw an actual dragon boat. The races are pretty cool. It needs super cooperation and attention of everybody in the boat. There is a drummer in the front, 20-22 paddlers and a steerman at the back. You will be amazed how synchronized with each other in paddling towards the finishing line. Sometimes, the boat may flip over and everybody will swim in the "dragon-boat water". The races are always held in the canals in the New Territories. Sometimes, there are a few in Aberdeen and some other remote areas in the New Territories. Year 2012 is a bit different. Part of it is because of the celebration of the 15th anniversary of the Handover which was taken place in 1997. Therefore, the races were held in Stanley, Tai O and even Tsim Sha Tsui. Although watching the Hong Kong Dragon Boat racing is free, it may be too difficult to squeeze into the big crowd. If you are not comfortable being in a big crowd, don't feel bad to just stay indoors to watch. They broadcast it on TV and radio throughout the day of the Hong Kong Dragon Boat Festival. It's all about having fun.